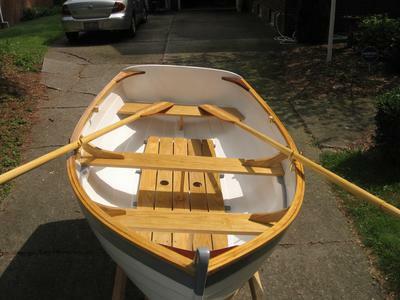 This new, fine little dinghy is an Ian Oughtred design and was recently built by a boat builder with 20 years experience. The hull is okkume mahogany. The remainder is sappelle mahogany, sassafras, ash and white oak. West System epoxy was used throughout the construction process. A set of handcrafted ash oars is included. $1,850.00. You think this tender, fit on top of my pick-up, or is to have to care and move to there? It's a fine looking dingy. What the widest point onthe beam? A bit more than I have in the budget right now, but I can work on it. I think she might be worth it! 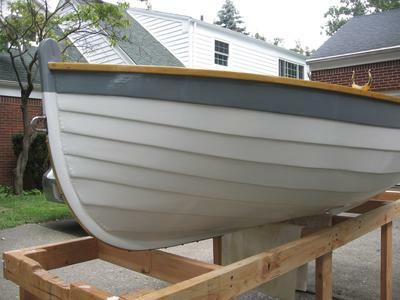 If interested in this boat you can contact me at 419-539-7403 or rhaywar@buckeye-express.com.